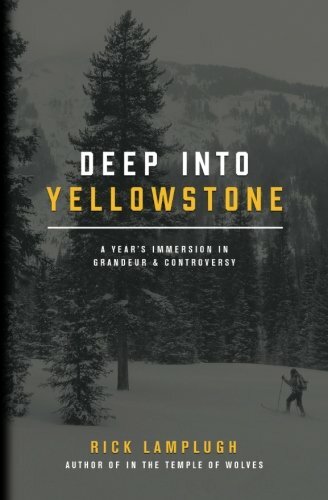 “Deep Into Yellowstone” by Rick Lamplugh begins with captivating action. Its first chapter seizes the reader with the spellbinding account of Rick and his wife Mary’s rare witness to a wolf pack on the hunt for bison. This natural predator vs. prey occurrence is a sharp contrast to the bison mass management shoot-out that the couple witness just days later. Throughout the story, the author emphasizes this strange juxtaposition of wildness and control for Yellowstone Park’s inhabitants. He points out that while there is safety for the animals living under the protection of the park, these same creatures are threatened when they step outside the invisible, political boundaries of Yellowstone. The book is filled with fun, thrilling and wondrous episodes of living through the seasons in America’s first national park. Rick and Mary’s adventure is set in motion with a three-month stint volunteering at the park’s Lamar Buffalo Ranch. After returning for several winters, their snowy retreat evolves into a long-term move to observe and advocate for the protection of wolves and bison. They select Gardiner, Montana as their new home because of its rural location on the border of Yellowstone Park. It is not a decision they take lightly, yet their dual drive to experience nature in its most raw form eventually overrides their comfortable life in Oregon. Choosing to read this adventure book was definitely out of the ordinary for me. Although I appreciate nature, its beauty and certainly value its significance, I am not a naturalist or even a keen observer of the environment. I have never had a desire to visit Yellowstone. Yet, I find Rick’s tales of his escapades in this raw setting to be mesmerizing. There is sufficient detail for the imagination to pique without being stifled by too many scientific elements. In the same vein, I learned just enough about the controversy between groups of bison and wolf conservationists and population managers to be intrigued. Therefore, the aspects of ecology, adventure, history and advocacy are well mixed in this book. In general, the reading not only held my interest, but also made me yearn to experience more. Needless to say, visiting Yellowstone is now on my bucket list. Rick Lamplugh’s book is self-published. This is a risky decision for a writer from a marketing standpoint but a brave choice to maintain a freer rein for creating such an honest account. In this way, the author is not unlike his subjects; both are content to exist in a natural habitat that is unencumbered by the restrictions and mandates of protocol. Throughout this yearlong story, “Deep Into Yellowstone,” the author, Rick Lamplugh and his wife enjoy skiing, hiking, biking and wandering through wildlife areas in and around the grandeur that is Yellowstone. The couple designate themselves as “meanderthals,” who observe, track and record the behaviors of the fascinating residents of the park. They are much more than this. They are the monitors and guardians of some of our nation’s most precious wildlife. This, then, is a story of preservation, respect and appreciation of the nation’s first national park that every U.S. citizen should experience.